Sports Direct has said it wants to remove all the current members of the Debenhams board except one, and appoint its boss Mike Ashley to run the business. The department store chain said it was "disappointed that Sports Direct has taken this action". Earlier this week, Debenhams issued another profit warning as its sales continue to fall. The struggling department store, which has 165 stores and employs about 25,000 people, reported a record pre-tax loss of £491.5m last year and said more recently that sales had fallen sharply over Christmas. Tuesday's profits warning followed three which Debenhams issued last year. It also said in October that it plans to close 50 stores, putting 4,000 jobs at risk, over the next three to five years. In January Mr Ashley joined together with investor Landmark Group to vote the retailer's chairman and chief executive off the board. Sergio Bucher remained as chief executive of Debenhams but no longer sits on the board. In a statement, Sports Direct said it had called for a general meeting of Debenhams shareholders to appoint Mr Mike Ashley to the board of directors of Debenhams, and to remove all of the current members of the Debenhams board, other than Rachel Osborne who became a director in September 2018. It said that if Mr Ashley were to be appointed to the board of directors of Debenhams "during this business critical period for Debenhams", Mr Ashley would carry out an executive role, and would focus on the Debenhams business, "including building a strong board and management team". 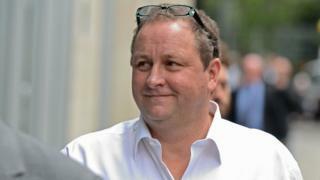 "If appointed, Mr Ashley would step down from his current roles as a director and chief executive of Sports Direct," it added. He would be replaced as acting chief executive by Sports Direct's deputy chief financial officer Chris Wootton. Mr Ashley, who founded Sports Direct, has been taking an increased interest in Debenhams. Sports Direct already owns 29% of the shares in the department store chain. It did offer a further investment of £40m, which Debenhams rejected. In February, Debenhams came to an agreement with its lenders which secured it a cash injection of £40m. The extra money extended the retailer's £520m borrowing facilities with banks for 12 months and enabled it to continue talks about a longer-term refinancing. In a statement, Debenhams said it had received notice from Sports Direct "proposing changes to the board". "The board has been engaging with Sports Direct and our other stakeholders and is disappointed that Sports Direct has taken this action. Last year, rival department store chain House of Fraser fell into administration before Mr Ashley bought its assets for £90m.